Trying a little something different with today's look. I usually don't go too grunge with my looks, but this one turned out that way & I kind of love the effortless, 'just tossed this on' look, since many of my other looks are pretty thought out. Worrrrrk that grunge, girlfriend. Love the light ankle booties- stunners! I love the ease of both of these patterned pieces! 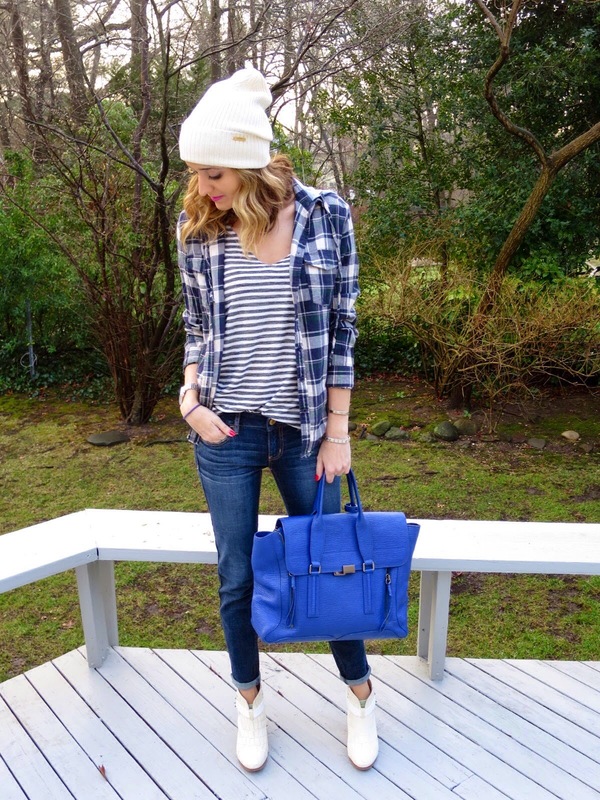 Loving the plaid and stripes together! Really awesome casual look. Very cute! Love the plaid shirt! 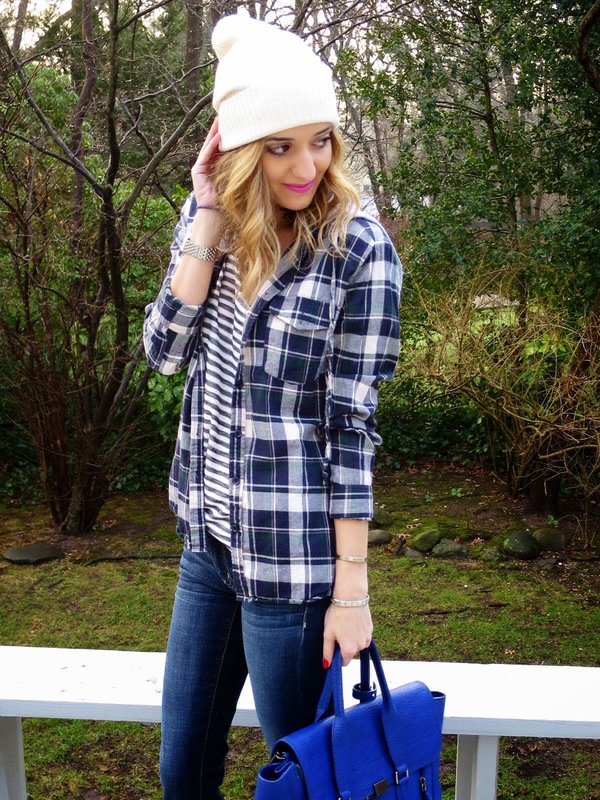 I love the mix of stripes and plaid! Me too - This look made pattern mixing easy! The pattern mixing is so cute and the boots and the bag have me in love!! Thank you! It's easy to mix patterns when they have the same color scheme! 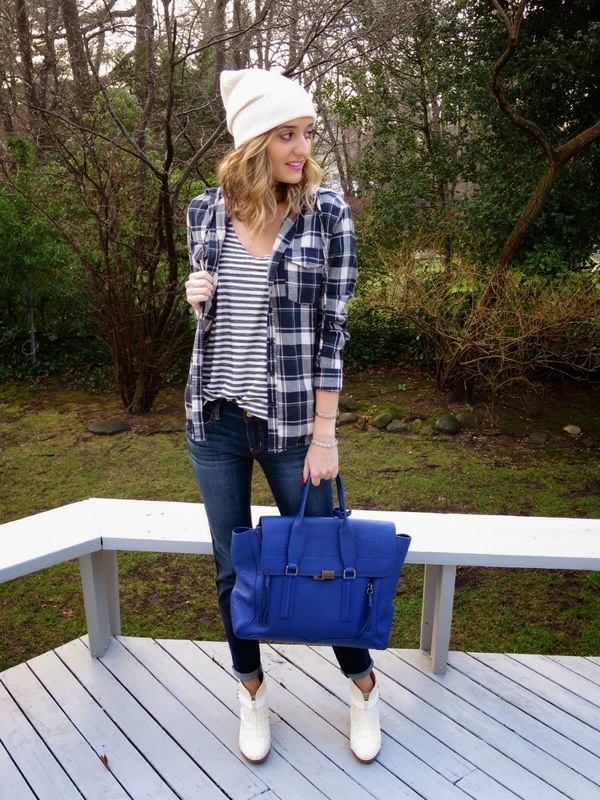 Super cute - love the plaid an stripe combo! Such a great weekend look! Totally - perfect for running errands or hanging around! I'm so glad you find it relatable! I would love to see how you style a grunge look! 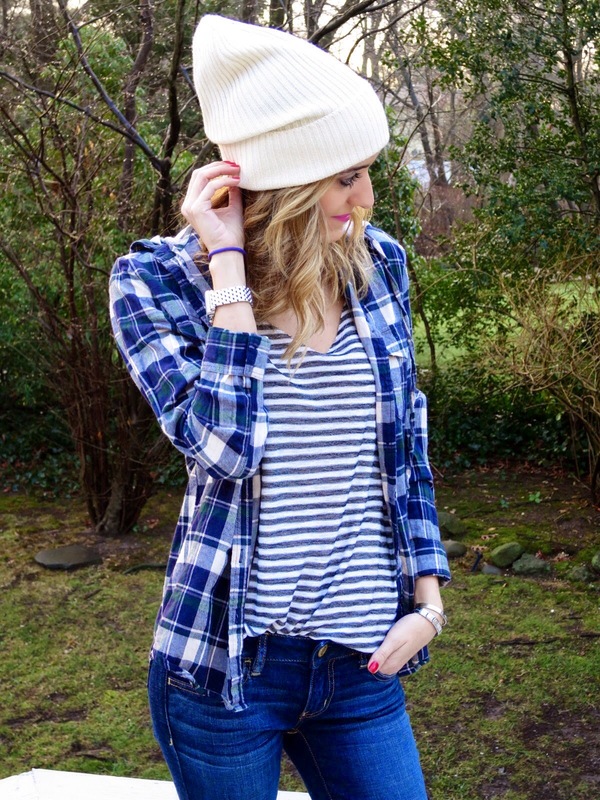 LOVE the strips and plaid combination offset by the ivory/white booties and beanie. Great bag! What color would you call it? New York Rangers blue? Congrads on the Rangers clinching there division. My Flames are still fighting for a spot. Oh, it sure is a NYR blue! I am looking forward to playoffs! I love this combination! The stripes and plaid together are a great execution of pattern mixing. :) I also love the shoes (and just bought a similar pair for myself in gray). Thanks for sharing! I love these booties! I end of wearing them in all 4 seasons because of their light color! Love the stripes and plaid, Michelle. So chic indeed!